In today’s society, you can be bombarded with the everyday stressors of life. My 2017 calendar will encourage you to stay focused and motivated on your fitness goals with delicious recipes, inspirational quotes, exercise tips and my photographs (The pictures demonstrate a formula for success … regular workout regimen+ healthy eating = achieved results.). Get ready for a New You this New Year! In today’s society, you can be bombarded with the everyday stressors of life. 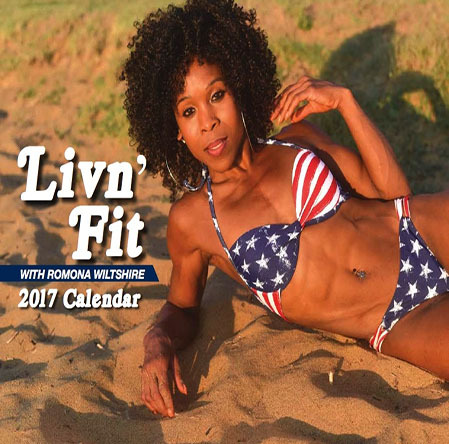 My 2017 calendar will encourage you to stay focused and motivated on your fitness goals with delicious recipes, inspirational quotes, exercise tips and my photographs (The pictures demonstrate a formula for success … regular workout regimen + healthy eating = achieved results.). Get ready for a New You this New Year!